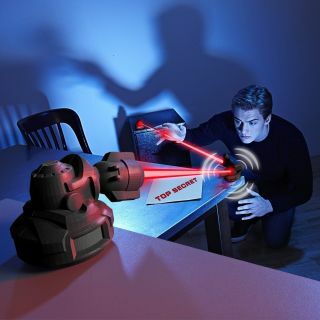 Protect your space with invisible laser beams. Warning alarms alert you to intruders, while 3 laser units from a perimeter that protects your secret stuff. With the Lazer Defense Network from Spin Masters' Spy Gear toy line, kids can create their own defence network at night or during the day. Using its lazer receiver unit and two lazer transmitter units, set the receiver to day or night setting to keep your defence undetected. Then turn on the two transmitters. Aim the transmitters' beams at the receiver unit until they align. The alarm will beep to confirm it is armed. Like a trip wire, once the network is set up and someone interrupts one of the two beams a five second alarm will sound. Press the on/off button on the receiver to cancel the alarm and press it again to re-arm.